Did you know you may have products you use every day that could actually be killing you? 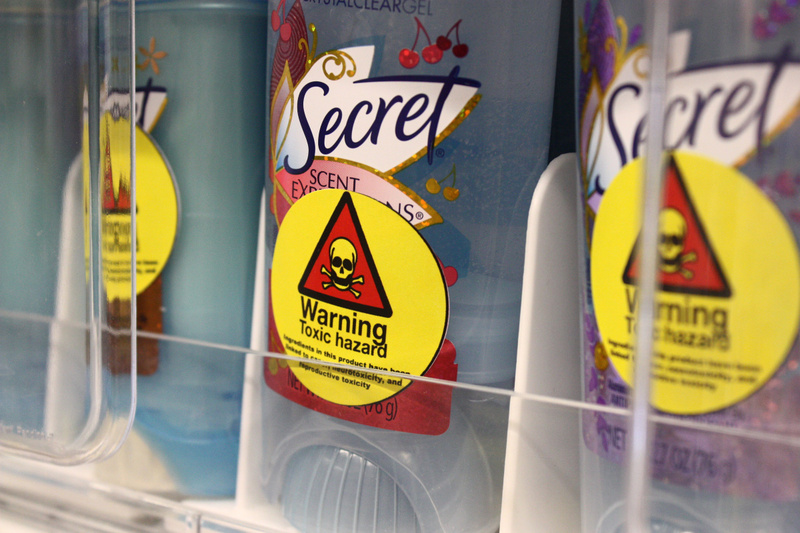 That bottle of cleaning solution or that bottle of hand lotion may not be as safe as you think. 1. Most Store Bought Deodorants: It’s a fact, aluminum, which is found in most deodorants, is now linked to breast cancer. If you are buying a store-bought deodorant, make sure the label clearly says “aluminum free”. Even better, opt for natural brands which aren’t loaded with chemicals and “fragrance”. Or, if you’re feeling ambitious, you can make your own. If you choose to do so, simply combine 1tbsp of organic coconut oil, 1tbsp of shea butter, 2 tbsp of arrowroot powder, and 1.5 tbsp of baking soda and heat in a double broiler. Once the mixture is melted, add in your favorite essential oils, mix it all together, pop the mixture in the fridge to cool, and congratulations, you’ve just made your own homemade deodorant, and aluminum free! 2. Household Cleaners: Many household cleaners contain such high levels of toxic chemicals, they are banned in other counties due to the harmful effects on the lungs when used. Here’s a tip – if the label says “fatal if swallowed”, it’s a good indication the product is poisonous, and you don’t want it in your home. Instead, switch to “green” cleaning products made with essential oils, or use common items around your home such as baking soda and vinegar. 3. Antibacterial Soap: While you may think antibacterial soap is the most effective soap to use for your child, nothing could be further from the truth. Not only does antibacterial soap create superbugs the human body has difficulty fighting, these superbugs are resistant to traditional medical care. Even worse, some of the ingredients in antibacterial soap like triclosan are said to disrupt hormones and impair muscle function. In addition, studies now show antibacterial soap isn’t even any more effective than regular soap! 4. Body Lotion: Next time you think of lathering up your skin with most common store-bought lotions, think again. Loaded with processed chemicals and other proprietary items, you don’t even know what you are putting on your skin. If you look at the back of the bottle, chances are you can’t even pronounce half the ingredients. Even more scary, companies can get away with saying it contains “fragrance”, without having to list what chemicals actually makes up that scent. 5. Candles/Air Plug-ins: Burning candles may make your home smell inviting, but you’re actually releasing chemicals into the air, and then breathing them back in. Instead, try diffusing essential oils with relaxing scents such as peppermint, lavender, or clove. You can even purchase essential oils that purify, which will cleanse the air you breathe and make it smell good too! By switching to natural and homemade products, you are creating a safe environment for your family. You may not be able to control the world, but you can control what goes on in your home. What toxic product do you plan to eliminate in your home first? Have you found natural products which you would recommend to other moms?